The refugee advocate, and advocate of anyone else lucky enough to have a victim status, was whining that family doctors in British Columbia have up to 600 patients, and that such a high number stretches them to their limit. So, we went to our personal health file with Helsenorge.no (Norway Health Authority) to see the average number of patients for a family doctor in Tromsø. 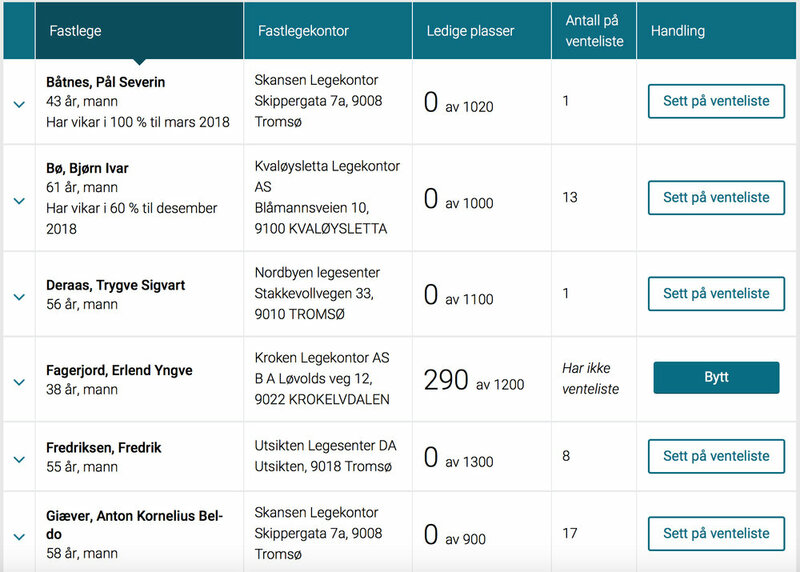 Yes, in Norway, you can pick your own family doctor online, from a list that shows available spots, total number of patients, and waiting list if applicable. You can even sort the doctor list by gender (and there are only two of them), something clearly unfathomable in Canada. By the way, you can also access your complete health record online, and so does your doctor, which dramatically improves care and efficiency. Anyway, turns out that the typical family practitioner in Tromsø has between 900 and 1,300 patients... Between 30% and nearly 120% more than a family doctor in British Columbia. Yet, the healthcare system in Norway works pretty well, and we have yet to hear a doctor in Tromsø whine that he is overwhelmed by too many patients. This therefore strongly suggests a major lack of productivity, and possibly a marked sense of entitlement, for medical professionals in Canada... Which would also explain the typical very poor quality of care (let's remember that in Canada people die in Emergency Rooms waiting for care, and without medical staff realizing they are dead for days), the out of control healthcare costs, and overall, the failure of the Canadian universal health care system.